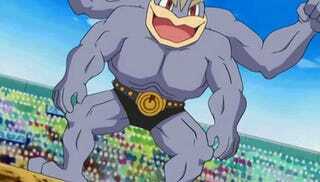 Marvel at Machamp! Pokemon One a Day! First of all, I want to address our Kotaku/TAYer Koda89: I saw your comment about the Vitruvian Man Machamp this morning, right before opening up Photoshop to continue work on...the Vitruvian Man Machamp I started yesterday in conjunction with Machoke! I didn't responsd because I didn't want to give away the fact that you were absolutely spot on in guessing how I'd tackle today's Pokemon illustration for the day! So yeah, I definitely didn't mean to ignore you, I had to do it to keep the secret of today's art safe. By the way, I read every single comment thrown at these things and try my best to reply, so let it be known! OKAY! I've gone on far enough, let's get onto Machamp! I had decided on doing Da Vinci's Vitruvian man crossover/parody well before having decided doing Michelangelo's David/Machoke crossover, having thought of it early on in the series. At first, I wondered if it would be a good idea for the long run of things of having two parodies back to back, and featuring works and styles echoing from a similar time and history - Machop had his own art style going for him and the idea is to do different styles each day...But then I realized something: Even if there are similarities in the origins of the direction for illustration, the way I'm presenting the Pokemon are different from one another visually. Just like David for Machoke featured a few alterations in rendering, I made Machamp squattier and way more thicker than the Vitruvian man. I added more muscle mass and decided to focus on bulk rather than showcasing lean cuts. I tried to keep the same general approach in the line work as the master - sharp neat lines, with the use of smaller lines to block in and shade areas. What Da Vinci was trying to prove or showcase with proportions would not work here, so this work isn't trying to continue on his ideas, but features elements of the original for the sake of parody in representing Machoke. I suppose not much else really needs to be said - the work is very straight forward. 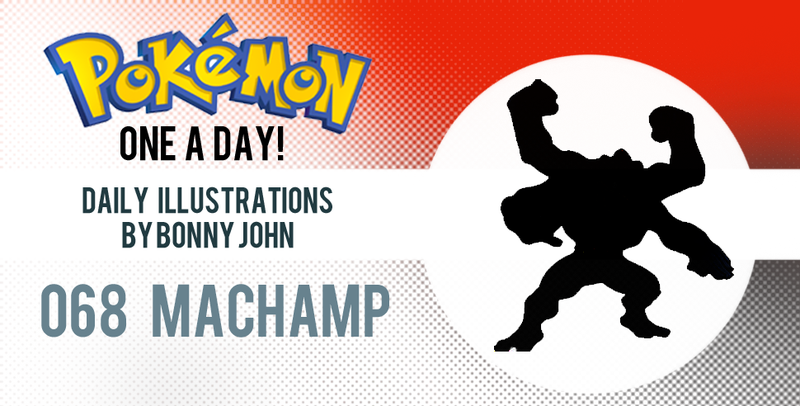 The concept of Vitruvian Man's extra arms and legs provided enough correlation between human and Machamp, and erasing the two extra legs and making the extra pair of arms attached is done with creative liberty for the illustration of the featured body-builder. I hope you enjoy the work and got a good idea of how I went about creating this design. Thanks always for looking and stopping by!